If you are looking for information on the Mr. Greek Restaurant franchise business opportunity, Mr. Greek Restaurant franchises or Mr. Greek Restaurant franchising, then you have come to the right place. Owner-operators share two common passions. One is for the restaurant business and the other is to succeed! Mr. Greek Restaurants is the largest & fastest-growing Greek restaurant franchise in North America. 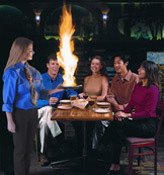 Twenty-one restaurants are now in operation, with 100 more expected in development by the end of 2006. Mr. Greek Restaurants offer two unique models - Fast Casual and Full Service - making Mr. Greek perfect for any location. Mediterranean food has long been considered flavorful and naturally healthy - and it's now one of the fastest growing segments in the restaurant industry with Mr. Greek positioned to dominate the segment. 2005 - Inducted into NOW! Magazine Hall of Fame for Best Greek Food and Best Greek Restaurant for 5 years. Mr. Greek has complete Grand Opening, Local Store Marketing, PR, Community Outreach and 4-Walls Marketing programs that get customized for each trade area to ensure maximum effectiveness. Mr. Greek's Creative team has developed numerous promotional materials and participates in many local philanthropic events such as a monthly newsletter, window signs, and POP materials. Mr. Greek has assembled a remarkable training team of food experts that spans North America. Mr. Greek training helps franchisees learn about running a successful and (most importantly) profitable multi-unit business. Every franchisee is required to complete the comprehensive training programs that focus on every aspect of Mr. Greek's business. Mr. Greek serves authentic Greek and Mediterranean. The full-service Mr. Greek Mediterranean Grill provides a full bar and offers seafood, pasta and grilled delicacies, saganaki, kalamari, as well as its signature souvlaki and gyros. The fast casual Mr. Greek Express takes "food on the go" to a new level, serving all meals on china for customers who dine-in. Both Mr. Greek concepts offer call-ahead, pick-up, take-out and delivery. Join the Mr. Greek team and become a part of a growing force in Greek.